These Wire Baskets Are Easy to Install! 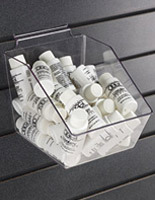 Hanging Containers Create High Visibility Displays! 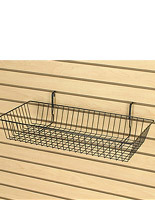 Order Wire Baskets and Other Slatwall or Grid Wall Accessories Online Today! Will fit most slatwall display panels. Durable steel construction features attractive black finish. Easy-attach hooks mount securely but are easily moved to new locations. 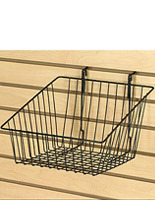 These wire baskets are versatile slatwall accessories that are great for bulk displays of small items. Snacks, toys, travel-size packages and point-of-sale impulse items will be easily seen when displayed in these deep merchandise racks. Each of these wire bins, black wire baskets features hooks to attach easily to slatwall (or grid wall) panels to create secure displays with high visibility. These economical displays can be used alone, in groups, or in conjunction with other slatwall accessories to create custom-looking retail store fixtures. 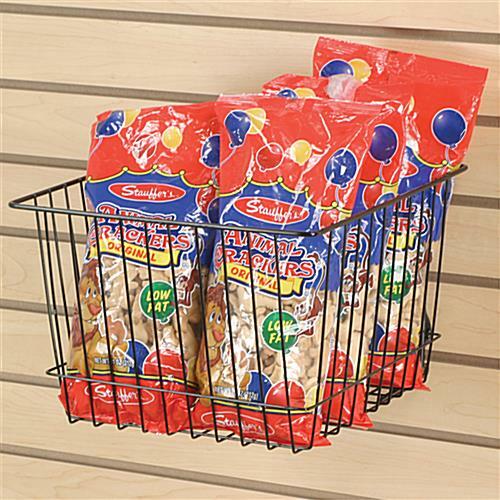 These slat wall wire baskets, also known as bulk display hangers, are an economical choice for retail establishments. Each of these wall hanging accessories measures 12" wide x 12" deep" x 8" high and is made from durable and attractive metal with a black finish. 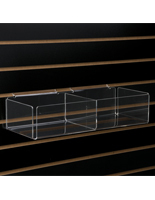 These display bins, slatwall wire baskets can easily hold multiple products of light to medium weight without sagging or falling. Sample-size items, toys, baseballs, candles, bagged products, snacks, tee-shirts and more can all be safely displayed in these hanging brackets. 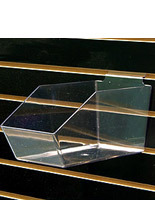 Because these wire baskets for retail store displays are so easy to attach to a panel, they can be moved to different locations as often as needed. 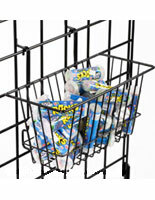 Impulse items are perfect when stored at eye height in this type of basket. 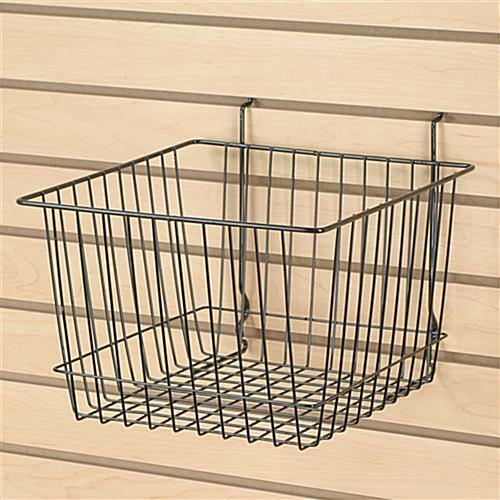 Any retail establishment that uses slatwall displays will want more than one of these economical and attractive wire baskets. 12.0" x 8.0" x 12.0"